During a prominent time for fair housing in America, the Dallas area has been the epicenter, thanks in large part to the work of the Inclusive Communities Project (ICP), a remarkable group of advocates. They were behind the biggest victory for fair housing in decades, a landmark U.S. Supreme Court decision last summer, and continue to push back at the institutions perpetuating racial housing segregation (that’s why we gave ICP vice president and deputy director Demetria McCain a Texas Houser Award in November). According to ICP, 90 percent of Dallas area residents who receive rent subsidies live in an area of racial minority concentration. 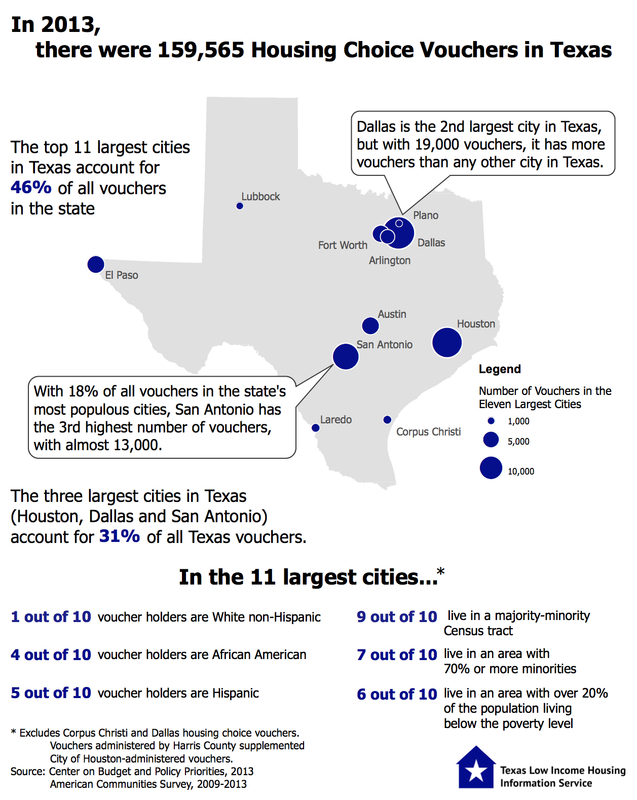 In Texas’ largest cities, 90 percent of voucher holders are African-American or Hispanic, and 90 percent live in majority-minority Census tracts. The Supreme Court has said that the concentration of Low Income Housing Tax Credits in minority areas, which happens far too often in Texas, can disparately impact people of color in a way that violates the Fair Housing Act. But the denial remains. Fortunately, unlike their peers at the county level, the leaders of the Dallas Housing Authority appear to understand the problem. DHA president and CEO Mary Ann Russ told the Tribune that she hopes the new federal fair housing rule brings Dallas-area housing authorities together to develop and submit a plan to combat segregation. As the rule begins implementation in the next few years, local and state agencies around the country will be required to study their housing policies and ensure that low income housing is no longer overwhelmingly concentrated in neighborhoods of color. This entry was posted in State issues and tagged AFFH, Dallas, Fair housing, HUD, ICP, source of income. Bookmark the permalink. You so called housing advocates are a different breed. You want to fight one discrimination case at a time with no real impact other than securing a lifetime and career of feeding off the federal dollars for yourselves when you could attack the systemic issue with the real main offender of fair housing laws – HUD. How can anyone expect States, Cities and Landlords to follow these laws when the main culprit and the one charged with enforcing these laws doesn’t?? Its irrational and ridiculous. Then, HUD gives you so called advocates “grants” so you continue to turn a blind eye to their bad deeds. Its a sick and disgusting industry and all of you should be ashamed of yourself!